SANAA (Reuters) – Thousands of protesters gathered in front of the Yemeni vice president’s residence on Tuesday, demanding the acting leader for wounded President Ali Abdullah Saleh form a transitional council to create a new government. The volatile situation in Yemen, which lies on vital oil shipping lanes, alarms Western powers and neighboring oil giant Saudi Arabia, who fear that chaos would enable the local al Qaeda franchise to operate more freely there. “We are calling for a peaceful and orderly transition,” Secretary of State Hillary Clinton said on Monday. British Prime Minister David Cameron called Vice President Abu-Rabbu Mansour Hadi, appointed by Saleh as acting president, and pushed for a ceasefire. Hadi has insisted that Saleh would return within days. SANAA (Reuters) – Saudi Arabia has brokered a fresh truce between a powerful Yemeni tribal federation and forces loyal to President Ali Abdullah Saleh, a Saudi source said on Saturday, and a tribal leader said his followers were abiding by it. A Saudi-brokered truce agreed a week ago held for only a day before fresh street battles broke out in the capital Sanaa, leading to the most intense fighting there since the uprising against Saleh’s 32-year role began. Broadcasters Al Jazeera and Al Arabiya, citing Yemeni and Saudi sources, said Saleh was on his way to Saudi Arabia for medical treatment, a day after suffering head wounds in a shelling attack on a mosque in the presidential compound, but Yemen’s deputy information minister denied the reports. Seven people were killed when what appeared to be rockets hit the presidential palace and several government officials were wounded. Saleh blamed a tribal federation for the assault. “The rocket was devastating. It was a clear assassination attempt against the president,” said Abdulla Ali al-Radhi, Yemen’s ambassador to the United Kingdom. The BBC reported that the attack left Saleh with shrapnel near his heart and second-degree burns to his chest and face. It said sources close to the president had told the broadcaster Saleh had a piece of shrapnel almost 7.6 cm long under his heart. Four months into a deadly revolt, worries are mounting that Yemen, already on the brink of financial ruin and home to al Qaeda militants, could become a failed state that poses a threat to the world’s top oil exporting region and to global security. Saleh’s forces retaliated by shelling the homes of the leaders of the Hashed tribal federation, which has been engaged in street fights with his forces. Spokesmen for the group said 10 tribesmen were killed and dozens injured while denying responsibility for the palace attack. Global powers have been pressing Saleh to sign a Gulf-brokered deal to end his 33-year rule. Leaving Yemen, even for medical care, would make it hard for Saleh to retain power and could be seen as the first step in a transfer of leadership. “It’s not easy for the president. He has lost people close to him and who were sitting next to him when it happened,” the official said. 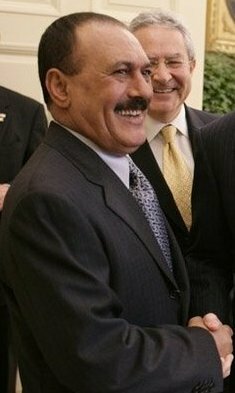 Saleh has exasperated his former U.S. and Saudi allies, who once saw him as a key partner in efforts to combat Yemen-based al Qaeda in the Arabian Peninsula (AQAP). Defying world pressure, Saleh has thrice reneged on a deal brokered by Gulf states for him to quit in return for immunity from prosecution, even as he haemorrhages support at home. Residents in Sanaa faced worsening fears after fighting between the Hashed tribal federation and Saleh’s forces spread to new parts of the divided capital on Friday, prompting a fresh exodus of war-weary civilians. Tensions in the flashpoint of Taiz, about 200 km (120 miles) south, eased after police and military units withdrew from the city following a week of clashes with pro-reform demonstrators that left dozens dead. The U.N. human rights chief was checking reports that more than 50 people had been killed in Taiz since Sunday. Nearly 200 people have been killed in the capital in the past two weeks as street battles using machineguns, mortars and rocket propelled grenades shuttered shops and forced Sanaa’s airport to ground flights twice. Sanaa roads were clogged when the sun rose by civilians fleeing violence that has engulfed more of the city. “Bullets are everywhere, explosions terrified us. There’s no chance to stay any more,” said Sanaa resident Ali Ahmed. Spain said it was evacuating its citizens and diplomats in Yemen, while Germany ordered the temporary closure of its embassy, adding to the number of countries shutting the doors on their diplomatic missions in Sanaa due to the fighting. At least 420 people have been killed since the uprising against Saleh began in January, inspired by the movements in Tunisia and Egypt that toppled their long-standing leaders. The battles are being fought on several fronts, with popular protests in several cities and military units breaking away from Saleh to protect the protesters. There has also been a week-long campaign in Zinjibar by locals and Saleh’s soldiers to oust Islamist and al Qaeda militants who seized the southern coastal city near a shipping lane where about 3 million barrels of oil pass daily. TEHRAN (Reuters) – Iranian President Mahmoud Ahmadinejad said on Monday that oil prices will reach $150 per barrel and the current crude prices were “not real”. 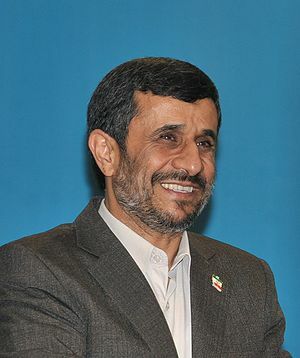 “The price of oil will increase to $150 per barrel in a period of time … the current oil prices are not real,” Ahmadinejad told a news conference. Oil traded above $119 a barrel for Brent on Monday, just off a two-and-a-half year high touched in February, spurred by political instability in the Middle East and North Africa. Iran is OPEC ‘s second biggest crude producer after Saudi Arabia . Disruption of Libyan exports because of violent unrest in the OPEC member country also provided an opportunity for Iran to sell some of the crude that had built up in floating storage. A popular uprising in Libya has shut down almost all of the country’s 1.6 million barrels per day (bpd) of oil production, prompting Saudi Arabia to boost crude output to try to compensate for the loss and rein in oil prices. MANAMA, Bahrain – Soldiers and riot police used tear gas and armored vehicles Wednesday to drive out hundreds of anti-government protesters occupying a landmark square in Bahrain’s capital, a day after emergency rule was imposed in the violence-wracked Gulf kingdom. At least six people were killed, according to witnesses and officials. The full-scale assault launched at daybreak swept into Pearl Square, which has been the center of uprising against Bahrain’s rulers since it began more than a month ago. Stinging clouds of tear gas filled streets and black smoke rose from the square from the protesters’ tents set ablaze. Witnesses said at least two protesters were killed when the square was stormed. Officials at Ibn Nafees Hospital said a third protester later died from gunshot wounds in his back. The witnesses spoke on condition of anonymity because of fears of reprisals from authorities. Meanwhile, Bahrain state TV also reported that two policemen died when they were hit by a vehicle after anti-government protesters were driven out. The Interior Ministry also at least one other policeman was killed, but did not give the cause. It was unclear whether the offensive included soldiers from other Gulf nations who were dispatched to help Bahrain’s Sunni monarchy, which has been under relentless pressure from the country’s majority Shiite Muslims to give up its monopoly on power. But state TV broadcast video showing military vehicles in the square flying Bahrain’s red-and-white flag as security officials moved through the wreckage of the encampment, set up at the base of a towering monument to the country’s history as a pearl diving center. The video showed the ground littered with debris, including satellite dishes and charred tent poles. Helicopters crisscrossed over the square, which was cleared by security forces late last month but was later retaken by protesters after a deadly confrontation with army units. Protesters fled for cover into side streets and security forces blocked main roads into Manama. Mobile phones were apparently jammed in central Manama during the height of the attack and Internet service was at a crawl. Hamid Zuher, a 32-year-old protester who slept at the square, said riot police first moved in on foot through a haze of tear gas, firing in the air. In Shiite villages, people went to mosques to pray in a sign of protest against the Pearl Square crackdown. Others lit fires in anger. Clashes were reported in other mostly Shiite areas of the country, where traffic was tightly controlled by military forces in an apparent attempt to prevent protest gatherings or a surge of people toward the capital. The roadblock also kept protesters possibly injured in the Pearl Square raid from reaching the main state hospital, which was working on generator power. The extent of the blackout in Manama was not immediately clear. The official Bahrain news agency said the emergency rule bans “rallies and disrupting the public order” and imposes “movement restrictions” and possible curfews in some locations. For Bahrain’s authorities, clearing Pearl Square would be more of a symbolic blow against protesters than a strategic victory as opposition groups are still be able to mobilize marches and other actions against the leadership. Bahrain’s king on Tuesday declared a three-month state of emergency and instructed the military to battle unrest in the strategic nation, which hosts the U.S. Navy’s 5th Fleet. Shortly after the announcement, clashes erupted across the island nation, killing at least two civilians. Saudi officials also said one of it’s soldiers was killed. Bahrain’s sectarian clash is increasingly viewed as an extension of the region’s rivalries between the Gulf Arab leaders and Shiite powerhouse Iran. Washington, too, is pulled deeply into the Bahrain’s conflict because of it’s key naval base — the Pentagon’s main Gulf counterweight to Iran’s growing military ambitions. On Tuesday, Iran and it’s allied force in Lebanon, Hezbollah, denounced the presence of foreign soldiers in Bahrain. Iran has no direct political links with Bahrain’s main Shiite groups, but Iranian hard-liner in the past have called the tiny island nation that “14th Province” of the Islamic Republic. Gulf rulers, particularly Saudi Arabia, fear that the collapse of Bahrain’s Sunni monarchy could embolden further revolts across the region and embolden the Saudi Shiite minority whose home region is connected to Bahrain by a causeway. The state of emergency in the U.S.-backed regime gives Bahrain’s military chief wide authority to battle protesters demanding political reforms and equal rights for the majority Shiites. Also Tuesday, Secretary of State Hillary Rhodium Clinton expressed alarm over “provocative acts and sectarian violence,” and said she telephoned Saudi Foreign Minister Prince Saudi to stress the need for the foreign forces to promote dialogue. “We call for calm and restraint on all sides in Bahrain,” Clinton told reporters in Cairo, where she was urging on democratic currents that chased Egypt’s Hosni Mubarak from power last month. Meanwhile, the Pentagon authorized military family members and civilians with non-emergency jobs to leave Bahrain as violence spread. A spokeswoman for Bahrain’s Gulf Air, Noof Buallay, said flights were operating normally at Manama’s airport. The intervention of more than 1,000 Saudi-led troops from several Gulf nations was the first major cross-border military action to challenge one of the revolts sweeping across the Arab world. The Al Khalifa family has ruled Bahrain for 200 years. The foreign troops are from the six-nation Gulf Cooperation Council‘s Peninsula Shield Force. The bloc is made up of Saudi Arabia, Oman, Kuwait, Bahrain, Qatar and the United Arab Emirates — all largely Sunni countries that have nervously watched the Arab world’s protests. The Saudi government on Tuesday withdrew accreditation to the chief Reuters correspondent there, complaining about a recent report on a protest in the kingdom. Reuters stood by its coverage. Iran denounced the foreign intervention as “unacceptable” and predicted it would complicate the kingdom’s political crisis. A senior Bahraini foreign affairs official, Hamad al-Amer, called the remarks “blatant intervention in internal Bahraini affairs” and said Iran’s ambassador to Bahrain was summoned to the Foreign Ministry. A security official in Saudi Arabia said a Saudi sergeant was shot and killed by a protester in Bahrain’s capital, Manama. No other details were immediately given on the death of the soldier, identified as Sgt. Ahmed al-Raddadi. The Saudi official spoke on condition of anonymity because he was not authorized to talk to the media.